RICHLAND, Wash. — U.S. commercial building owners could save an average of 38 percent on their heating and cooling bills if they installed a handful of energy efficiency controls that make their heating, ventilation and air conditioning, also known as HVAC, systems more energy efficient, according to a recent report from the Department of Energy's Pacific Northwest National Laboratory. The estimated savings were based on computer modeling and simulation of building energy usage. The controls that could provide these savings are not widely available commercially, but the report's authors hope their analysis will encourage manufacturers to expand their production. "Investing in an American economy that is built to last includes taking advantage of all of America's energy resources while working to improve efficiency," said U.S. Energy Secretary Steven Chu. 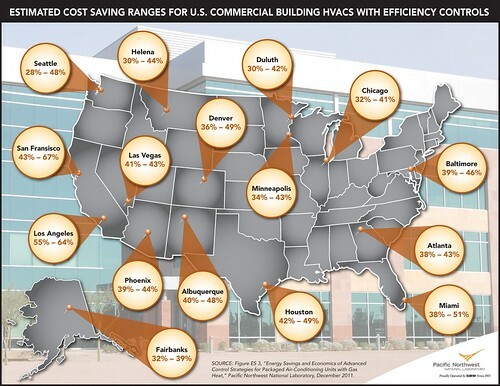 "By making heating, ventilation and air conditioning systems in buildings more energy efficient, American businesses can save a significant amount of money by saving energy." "The potential savings from adding advanced controls to existing packaged air conditioners with gas furnaces is enormous," said PNNL engineer Srinivas Katipamula, who led the study. "The estimated savings depend on local climate and energy prices and range from a whopping 67 percent cost savings in San Francisco to a still-substantial 28 percent in Seattle." Supply fan speed controls slow or speed up the ventilation fan that circulates the building's air based on whether or not a desired temperature or amount of fresh air has been reached instead of continually running the fan at full speed. 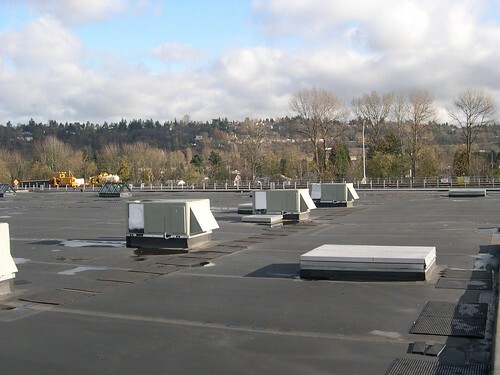 When the research team added up all the numbers, they found the best possible percentage cost savings was 67 percent, which could occur when all four controls are added to a rooftop packaged HVAC at a small office building in San Francisco. And the minimum percentage cost savings was 28 percent and could come from adding all four controls to a supermarket in Seattle. The table below shows the team's calculations on each building types' average cost savings. Their research also showed that Fairbanks, Alaska, could be home to the maximum annual dollar savings for all four building types. Fairbanks could experience savings as high as $52,217 per year at a supermarket and as low as $923 at a small office. The team reasoned that Fairbanks' dollar-saving advantage was due to its cold climate, which benefits more from the decreased ventilation that occurs with demand-controlled ventilation, as well as the city's relatively high energy costs. The table below shows the average dollar savings that each building type could experience by installing all four controls. But savings weren't limited to cash and energy use. The team also found that a substantial amount of carbon emissions could be avoided if HVAC energy efficiency is increased. As many as sixteen 200-MW coal power plants — which generate enough energy to power 3,000 to 4,000 American homes — could sit idle if just half of the nation's packaged rooftop HVAC units on commercial buildings were retrofitted with controls, the simulations revealed. Three companies currently manufacturer HVAC controllers, but only one company offers a product with all the control options that resemble the team's simulations, Katipamula said. To help the manufactures better understand their market, the report also examines potential prices for the controllers and how long it would take for building owners to recoup that cost. "Our report makes a convincing case for manufacturers to produce more advanced HVAC controllers and for building owners to adopt these energy-saving methods," Katipamula said. Next, the team will test the estimated savings in the field. They're installing controllers into HVAC systems used on two rooftop units at an office building on PNNL's own campus in Richland, Wash. They're also planning to install several controllers in various commercial buildings across the United States. Once installed, the controllers will allow the researchers to measure real energy and costs savings. This research was funded by DOE's Office of Energy Efficiency and Renewable Energy. REFERENCE: W. Wang, Y. Huang, S. Katipamula and M.R. Brambley, "Energy Savings and Economics of Advanced Control Strategies for Packaged Air-Conditioning Units with Gas Heat," December 2011, PNNL Report No. 20955 for U.S. Department of Energy.